The international symposium "Eco-Innovations from Biomass" on March 20th and 21st was dedicated to the bio-based economy and its contribution to climate protection. Around 240 guests and sixty guest speakers from nine different countries participated in this network event, which was organized by the 3N Competence Center Lower Saxony, Network Renewable Resources and Bioeconomy e.V. for the sixth time. Dr. DI Robert Wimmer represented the Center for Appropriate Technology (AT) at this international meeting with a talk on Life Cycle Habitation - ecological thermal insulation systems. In his speech, he underlined once again the urgent need for future CO2-neutral and resource-conserving building and refurbishing. On the basis of the planned demonstration building LCH, he showed the numerous possibilities and fields of application for building materials made of renewables and their contribution to climate protection. A review of the congress, as well as a detailed program with all lectures and speakers can be downloaded from the homepage of the organizer 3N Competence Center. 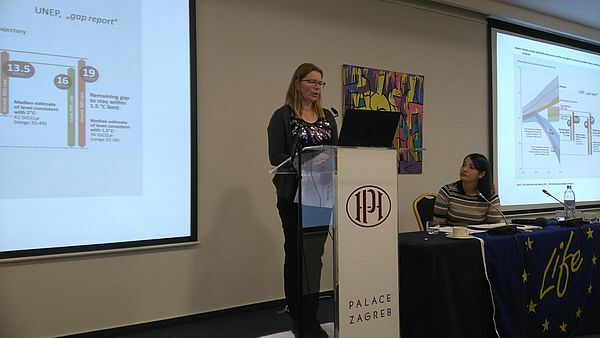 On Dec. 5th the Croatian Ministry of Environment and Energy organized the conference "LIFE programme – contribution to the implementation of climate change policies", an infoday for the LIFE Climate Action Programme of the European Comission. 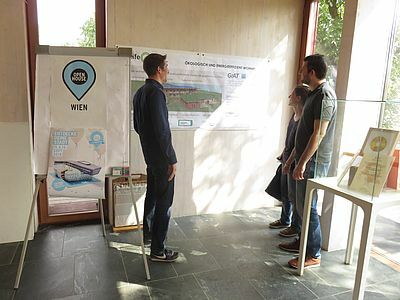 GrAT - Center for Appropriate Technology was invited by the ministry to present the "LIFE Cycle Habitation Project" at this event and to answer questions of the numerous visitors concerning practical experience in application and management of LIFE Climate Action Projects. Another interesting Austrian LIFE - Project was presented by Petra Mautner MSc ( Klimabündnis Tyrol) called "LIFE ClimAct - Climate Action Campaign for Low-Income Households". Altogether it was a quiet successful day! We are grateful for the invitation to this event and wish all participants a lot of success with their LIFE Climate Action Projects. On Saturday the 15th of September between 10:00 and 17:00 we had an open-door day within the framework event OPEN HOUSE VIENNA. More than 40 visitors have used the opportunity to visit the S-House with its ongoing exhibition and to get information about the latest developments of the EU LIFE "Life Cycle Habitation" project. We thank everyone for the deep interest and are looking forward to see you soon again at the BöZAT(Böheimkirchener Zentrum für Angepasste Technologie). In the framework of the Open House Vienna Event an open-door day will take placein the S-house in Böheimkirchen on Saturday the 15th of September between 10:00 and 17:00. On this day it will be possible to visit the award winning building as well as to get latest information about the EU Life Demonstrationproject Life Cycle Habitation. Staff from GrAT will be on-site for questions regarding the S-House and the Life Cycle Habitation Project. 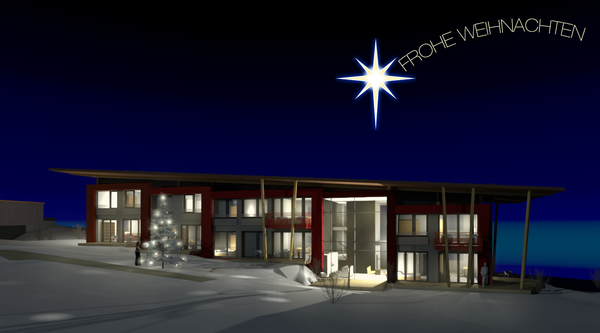 Address: 3071 Böheimkirchen, Obere Hauptstrasse 38; access with train: Böheimkirchen trainstation, 3 minute walk via main parking place on the right. In the context of the EU Green Week 2018 an open doors day took place at the BÖZAT - Böheimkirchen Center for Adapted Technology and at the S-House. As part of the event, the EU-Life + project "LIFE Cycle Habitation", a CO2-neutral demonstration complex with innovative energy supply, was also presented to the numerous visitors. 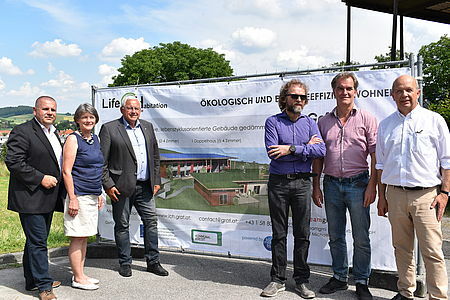 In a small ceremony, the construction site panel for the project was unveiled and presented by Dr. Robert Wimmer (GrAT), Thomas Mayer (EU monitoring team Neemo) and the major of Böheimkirchen Johann Hell. 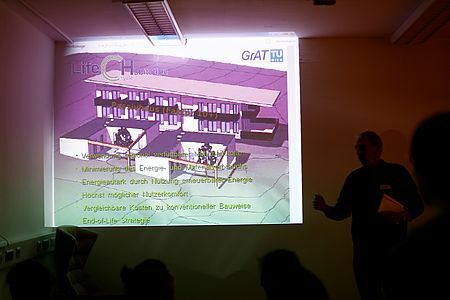 For the guests and those interested in the "trial living" there was the opportunity to inform themselves at an own desk and to ask questions to the responsible planning architect Georg Scheicher as well as DI Michal Berger of teamgmi responsible for building services and energy supply. In the ENZL Corner there was the opportunity for children and adults to try the energy bike and to inform themselves about the ongoing school project "ENZL - Energy to Life" (funded by the Talents Regional Program of the bmvit). The Böheimkirchner comedian Thomas Flatschacher leaded trough the program and the local restaurateur Denis Pop provided for the culinary well-being of the guests with his mobile catering service. 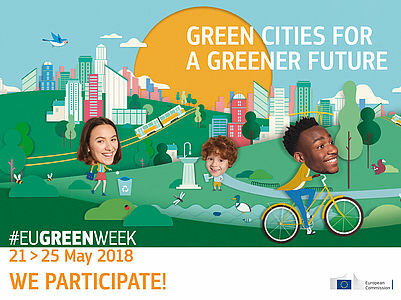 In the course of the EU Green Week 2018 “Green Cities for a Greener Future” an Open Door Day will take place at the Center for Appropriate Technology and the S-House in Böheimkirchen / Lower Austria on June 4th from 2 p.m. until 6 p.m.. On this day the groundbreaking ceremony for the EU-Life+-Demonstrationproject "Life Cycle Habitation" will be held as well from 2 p.m. until 3 p.m.. Food and Drink will be provided and we look forward to welcome you at the BÖZAT and the S-House. The Programm for this Event you can find here (in German). For organizational reasons we ask for preliminary message until 05-30-2018 to sekretariat@grat.at. 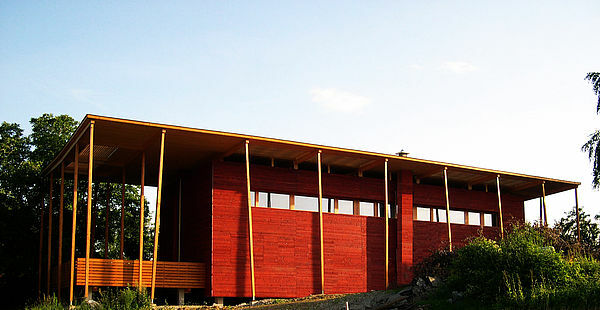 On Dec. 8th the Greenskills Sustainability Symposium took place in the Packhaus in Vienna. The agenda included numerous presentations and speeches about sustainable living, self building and international do-it-yourself projects. A fair also on the topic of sustainable living and an open space complemented the event. You can find more informationen about the symposium on the homepage of greenskills. 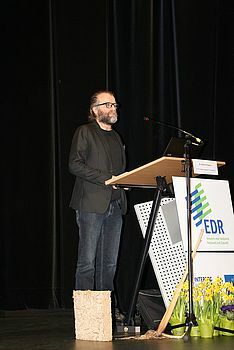 GrAT - representet by Erwin Krug - presented at the symposium their projects on the topic of sustainable living and building, especially the EU-Life+-project "Life Cycle Habitation". 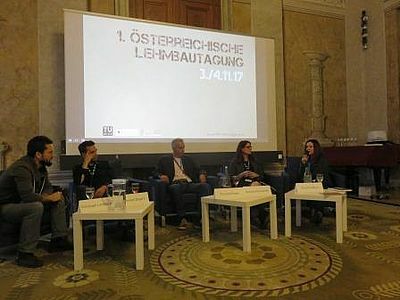 From Nov. 3rd to 4th the "1st Austrian Earthbuilding Conference" with numerous national and international guests took place at the Technical University Vienna. The organization of the event was done by a group of students around Ao.Univ.Prof. Dipl.Ing. Dr.phil. Andrea Rieger-Jandl, DI David Kraler und DI Christoph Lachberger. 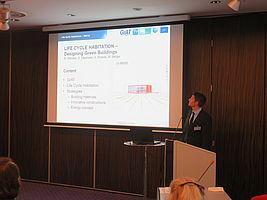 GrAT was invited to present and share the know-how on the topic of sustainable building with renewable resources and to present the EU-LIFE+-project LCH. 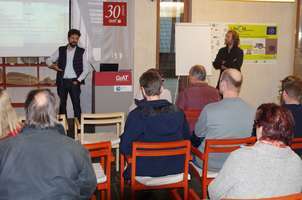 The aim of the event was the sharing and exchange of know-how, competences and experiences in connection with earth building. Numerous speeches, presentations and discussions intended to share and discuss actual research and new developments and to learn from one another. From 2nd to 3rd of May 2017 the 19th LIFE-Platform took place in Seekirchen am Wallersee (Austria / Salzburg). The conference was hosted by LIFE Project Northern Bald Ibis - Reason for Hope. After the greeting and introduction by Gerhard Schwach (Austrian Federal Ministry of Agriculture, Forestry, Environment and Water Management) and Heidi Reiter (Member of State Parliament Salzburg), the participants were informed about different important aspects concerning LIFE+ by the representativ for the EU-Commission Dorte-Pardo LOPEZ. 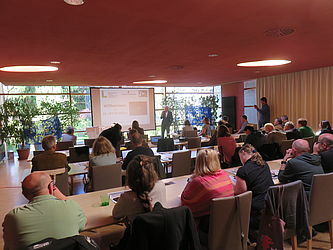 Both conference days were used to present different EU-Life-Projects by the participants. The World Café offered space for discussions and suggestions. Two excursions to the Wengermoor (LIFE-NAT project 1998-2004) as well as the LIFE - WALDRAPP project area rounded off the event. Pictures of the event: www.grosstrappe.at/de/projekte/life-projekt-2016-2023/events/life-projekt-veranstaltungen/759.html. During the Passiv House Days 2016 the S-House in 3017 Böheimkirchen (Lower Austria) was open for the public on Friday, 11th Nov. 2016 for everyone interested in strawbale buildings. Numerous visitors took the opportunity to visit the S-House and to get information about the possibilities of a ball-insulated passive house by the experts of the Grat. In the morning there was also a class of the HTL-Mödling, Department of Interior Architecture and Wood Technologies, as part of an excursion. The highlight of this open day was the get-together of straw house owners and potential builders organized by Strohblogger Christian Reisenthaler in the afternoon. With the help of Dr. Robert Wimmer and Erwin Krug (GrAT), the advantages of building were treated with straw and subsequently discussed with guests. 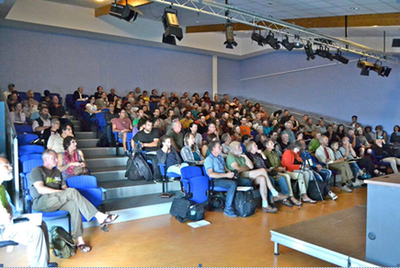 Especially the presentation of the "Life Cycle Habitation" project was very popular with the audience. Personal impressions of Christian Reisenthaler you can read in his Blog. More information concerning the GrAT and the S-House you can find under www.s-house.at and www.grat.at. The Grat's contribution was also published in the 9th edition of Energy Procedia. 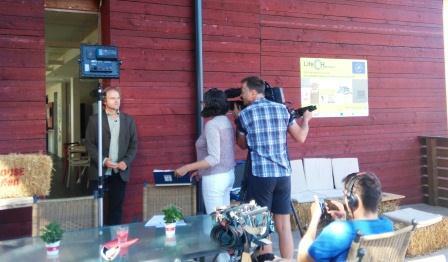 Thursday, Sept. 1st, 2016 the ORF-journalist Patricia Aradi visited the S-House in Böheimkirchen (Lower Austria) with her camera crew to shoot a television report for the ORF-Magazine "heute konkret". Dr. Robert Wimmer, CEO of GrAT, talked with her about the benefits of building with straw, the most important qualities of strawbales concerning insulation value, fire protection, etc., as well as about the current project "Life Cycle Habitation" and the objective to make straw bales more attractive for commercial and social housing. July 10th, 2016 "A totally normal house from straw"
CEO of GrAT and head of project for "Life Cycle Habitation" DI Dr. Robert Wimmer talks with Bernadette Redl from the Austrian newspaper "Der Standard" about the project and building with straw. 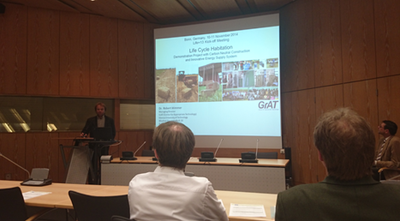 The EU Life+ Project "LCH - Life Cycle Habitation" was presented to numerous, prominent guests (researchers, politicians, business representatives) during the Symposium "30 years Appropriate Technology" at the Technical University Vienna. In the evening GrAT the guests had the possibility to discuss the symosium in relaxed atmosphere in the in the S-House in Böheimkirchen. At the S-House event, officials from the ministry (BMVIT), the local government of Böheimkirchen (including the mayor) as well as stakeholders from home and abroad (The Netherlands, Korea and Japan) were present. 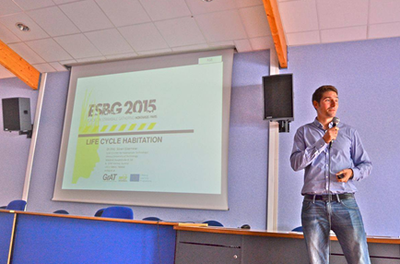 You can download the programme of ESGB 2015 here. 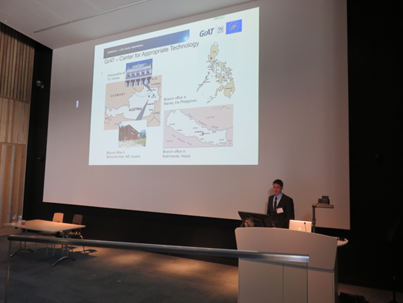 The project was presented at the official Life Kick-off Meeting in Bonn, Germany in November 2014, by Dr. Robert Wimmer. 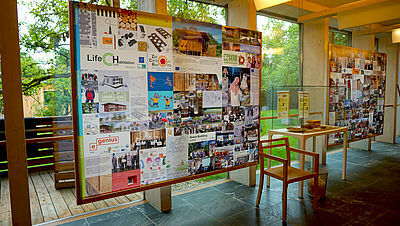 You will find the Paper: LIFE Cycle Habitation – Zero Carbon Building Concepts here for download.